Symptoms of heart attack may vary. All patients of heart attack do not experience the same symptoms or experience them to the same degree. Another interesting feature is that many heart attacks aren&apos;t as dramatic as the ones you&apos;ve seen on TV. In some patients, there are no symptoms at all. Still, the more signs and symptoms you have, the greater the likelihood that you may be having a heart attack. The timing of heart attack is not fixed and it can occur at any time of the day— at work or play, while you&apos;re resting, or while you&apos;re in motion. In some patients heart attacks strike suddenly, but many people who experience a heart attack have warning signs and symptoms hours, days or weeks in advance. 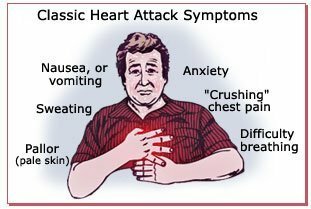 Most common and earliest warning of a heart attack may be recurrent chest pain (angina) that&apos;s triggered by exertion and relieved by rest. A temporary decrease in blood flow to the heart causes angina.